The thermometer may not yet suggest that spring has come to the Adirondacks, but a sure sign of winter’s impending demise is the wood smoke rising from the local sugar shacks. Mid March usually brings the optimum conditions, when temperatures are still below freezing at night, but the daytime thaw gets the sap flowing in the sugar maples. A healthy mature maple can produce over a gallon of sap a day, and the sugaring season can run for a month or more. It takes a lot of sap to produce maple syrup, and the forty or so gallons that a tree yields each season will produce a single gallon of syrup. The sap, which should have a sugar content of something more that 2%, must be boiled down in an evaporator until the sugar content is 60% or more. Commercial producers use many different fuel sources to boil off the sap, but traditionalists insist that wood is best, in part because it adds a slightly smoky flavor to the finished product. I agree. Syrups are graded strictly based on the syrup’s translucency. “Grade A” is clearer and has a more delicate flavor than “Grade B”. Sub categories such as light amber, medium amber, and dark amber, reflect a decreasing scale of translucency. Typically the sap collected later in the season will produce darker syrup. The lighter syrups have a more delicate “refined” flavor, but darker, nuttier tasting “Grade B” syrups are often preferred by enthusiasts, especially for cooking applications where bolder more assertive flavors are desired. My introduction to Adirondack maple syrup was an annual exchange with a friend who passed away a few years ago. Mike Terrio was a local restaurateur who ran Terrio’s Restaurant in Schroon Lake. Each spring I would bring some of John Mylod’s freshly caught shad roe up from Poughkeepsie for Mike, and he would give me some of his maple syrup. I think I got the better end of the deal. It is a wonderful coincidence that the sugar shack we visited today is run by Bill Christian, who bought Terrio’s with his wife Patty (which they renamed Witherbee’s Carriage House). Bill’s shack sits at the base of a mountain south of Schroon Lake village. His wood fired evaporator uses an original 1889 fire box. A system of interconnected open top stainless steel pans are used for the early stages of evaporation. He finishes the process on a smaller stove to more closely regulate the temperature. 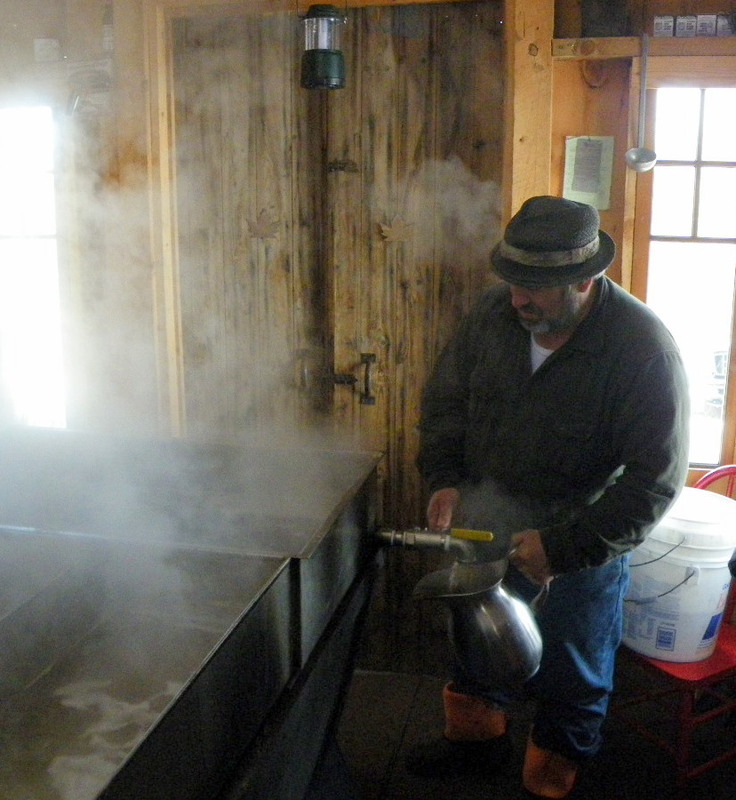 These sugaring operations are frequently located at mountain bases, to accommodate the miles of tubing that runs from the tree taps to a collection vat at the sugar house. 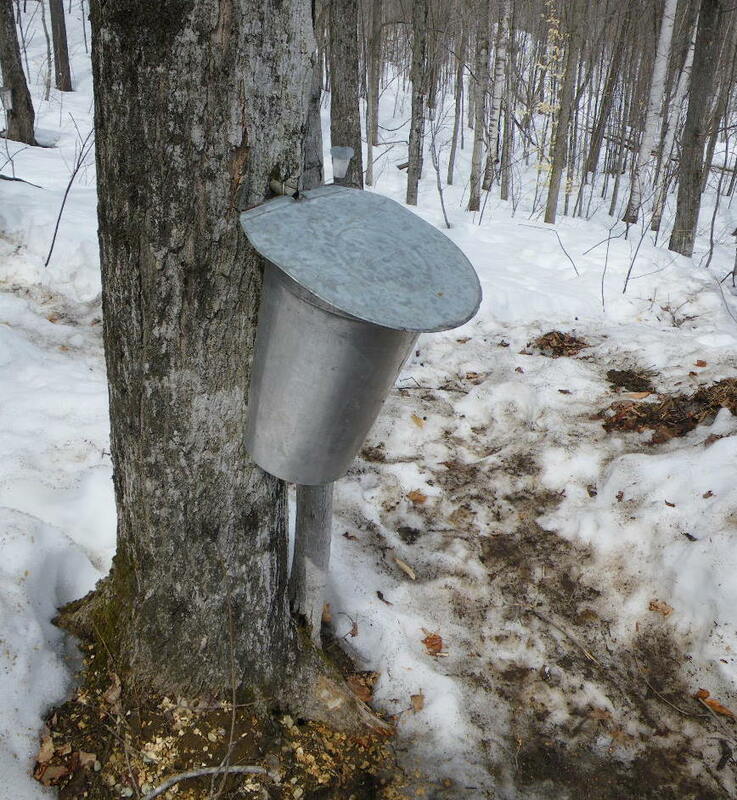 The tubing, which relies on a gravity feed, (and sometimes assisted by vacuum pumps) is connected to hundreds of maple trees (sugar bushes) uphill from the shack. These gravity feed tube systems, introduced in the 1970’s, are no small expense, but eliminate the need to empty hundreds of buckets on a daily basis. 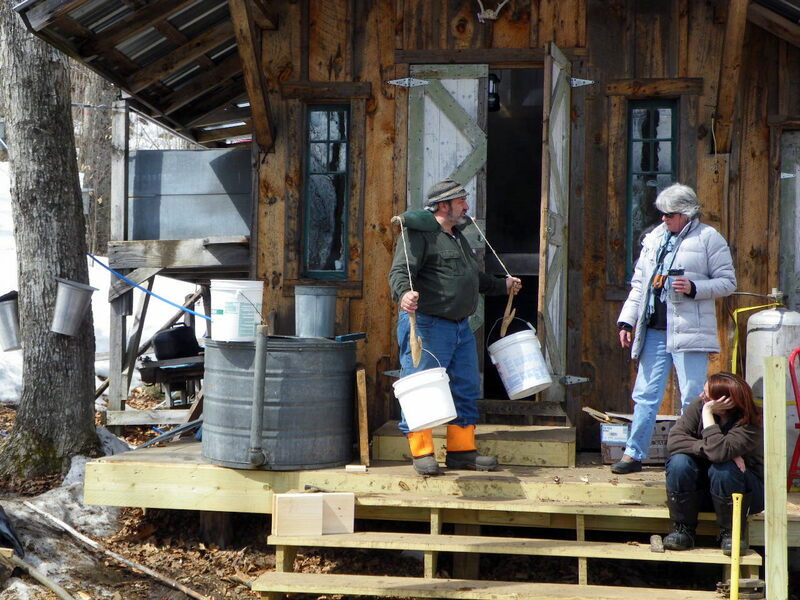 The Christians use a combination of individual buckets close to the sugar shack, and a tube collection system running from the trees farther up the ridge. 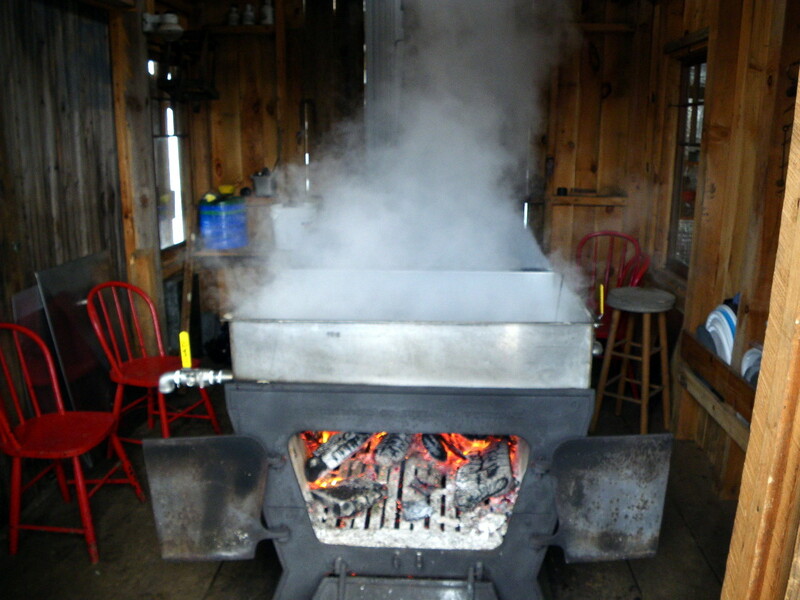 A visit to a sugar shack is a fun way to spend a day, after which you will definitely understand why real maple syrup costs what it does, and why it is worth every penny. Bill will never convince me that he profits a nickel from selling syrup, but we are very glad he does it.